Monkey Bread may seem like an unusual choice for an Italian meal, but we had company last night and I wanted to partner the lasagna with something a little more interesting than garlic bread. A savory version of Monkey Bread, which is usually made in a Bundt pan and often called “pull-apart” or “bubble” bread, seemed like a good idea. However, rather than serve monkey bread in a Bundt pan, I piled the balls of bread dough in my one and only Emile Henry Pie Dish . The presentation was a hit, and I can’t wait to make it again. The first step is to line the pie dish with flavored butter. 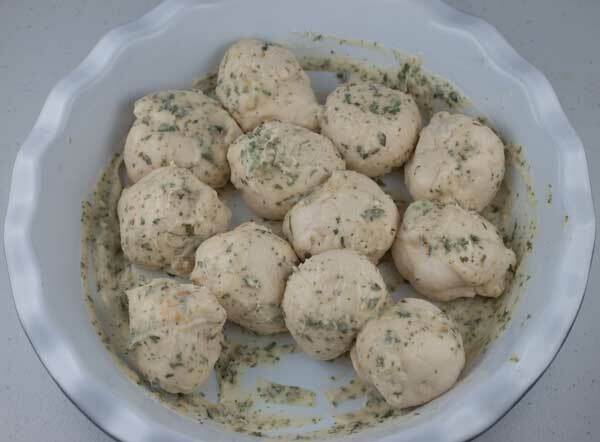 Next, you dip thawed frozen dinner roll dough balls into butter and arrange them in the pie plate. Lovely, eh? 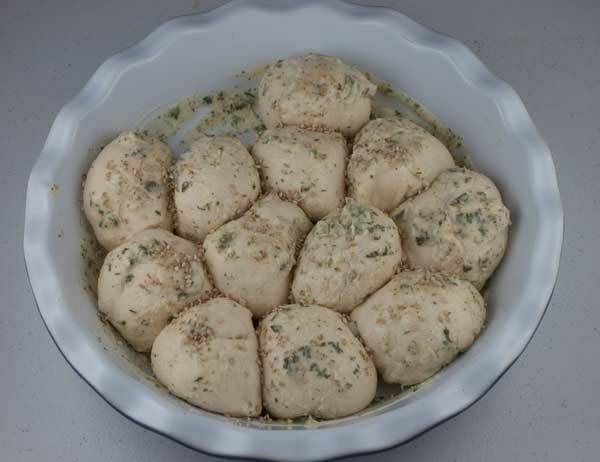 If the dough balls are frozen, it should take about 4 hours for them to rise. If they are thawed and cold, they’ll rise in 1 1/2 to 2 hours. And of course they’ll rise even more in the oven, so it’s a good thing I left some gaps. Now I have a second pack of thawed bread dough in the refrigerator and will probably try a small batch version of the traditional caramel flavored monkey bread made with pudding mix. This is savory version of monkey bread made with a flavored garlic butter. 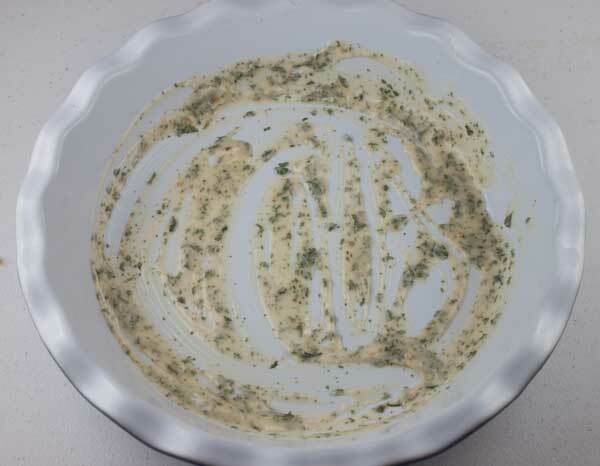 Combine the melted butter, parsley flakes, garlic powder and salt in a bowl. Pour just enough of the melted butter mixture into a 9 inch deep dish pie plate to coat the bottom. Brush a little bit on the sides as well. Dip thawed dough pieces in remaining butter mixture and arrange them dipped side up in the plate. Brush any remaining butter over the top. Cover with an overturned mixing bowl and let rise at room temperature until doubled in bulk -- about 1 1/2 to 2 hours depending on how cold the dough is. Preheat oven to 350 degrees and bake for 30 minutes or until golden brown. Christine, thanks for asking! I’ll go back and add the brand as a note in the recipe. The brand I used was Rhodes. 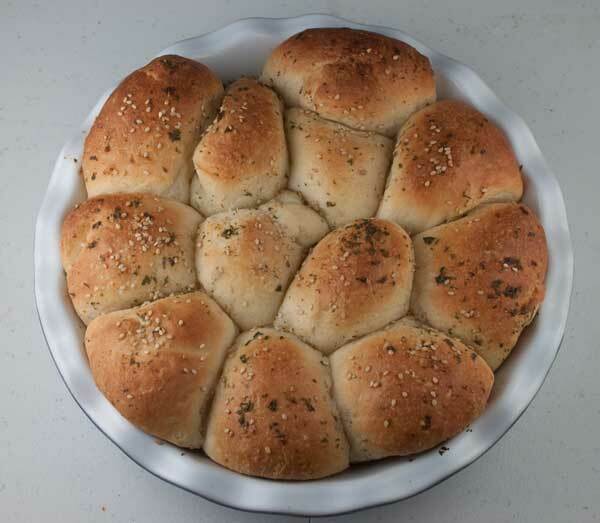 I can’t wait to make this, especially since this recipe uses pre-made dough. Would you kindly point me to the kind or brand you used? I don’t think I’ve ever come across them before. Thank you! Mary, I don’t know what took me so long to try it. At first I felt a little guilty using frozen dough rather than scratch, but nobody in the group seemed to care whether the dough was scratch or frozen. Also, I left off Parmesan because Todd doesn’t like it, but I’m sure it would make the rolls even better. We have been making this for many years. We also between the layers put Parmesan cheese on it also. it is so good. Hot bread of any kind is good in my opinion!! We had this last night when company came over. Just a note that if anybody makes this, you’ll probably want to make two as it goes fast! The presentation is great, as well as the taste. Not a heavy bread, it’s nice and light.